Hitsujiyama Park is a violet leaning soft pale pink. It is so delicate and light. It also has on-tone shimmer, light pink shimmer and sparse holographic pigment. The formula is slightly thinner than other Elevations, but it applied great. The first coat dries a little patchy, but the second coat completely evened it out. But I never expect anything from the first coat. This is two coats with a top coat. Baby Yeti is a fun crelly glitter. It has a gray crelly base, silver shimmer, holographic pigment. The multi-colored, multi-shaped and sized glitter is iridescent and plentiful. It even has a small (very small) amount of bar glitter. It is also thermal. The thermal is subtle and goes from light gray to a medium gray. You can see the slight color shift on the tips of my nails. This is two coats with a top coat. Shinjuku Golden Gai is a gorgeous blood orange (almost) shade with a slight duo chrome. It's got so many personalities. It's kind of orange; a little bit pink and a little bit hot coral. The shimmer is intense and shifts from blue to a violet pink. 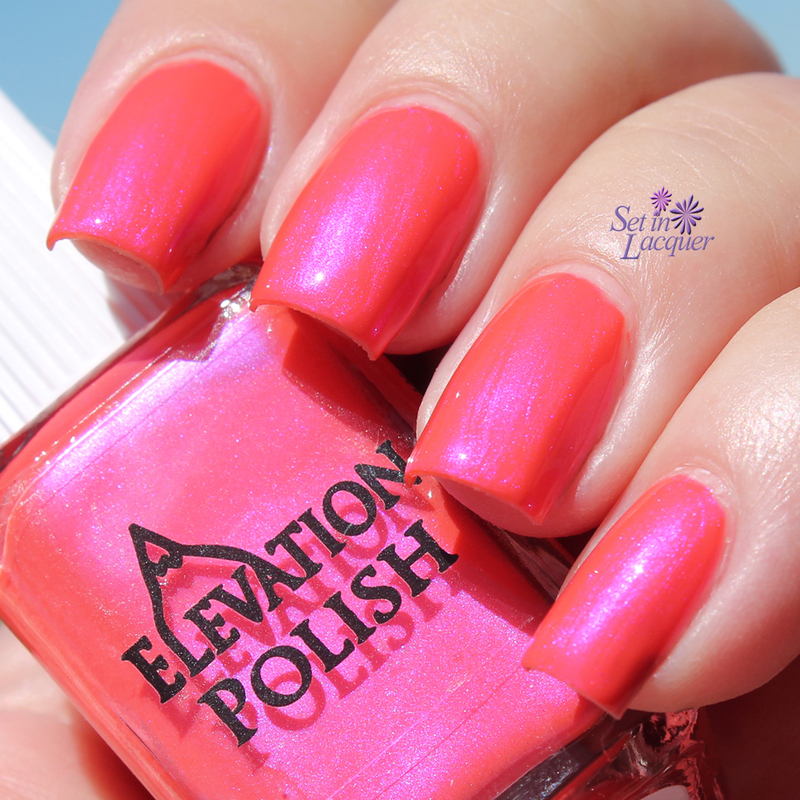 This is my favorite of the collection and maybe one of my top five faves from Elevation! This is two coats with a top coat. Hama Rikyu Gardens is a concrete gray with a silver pearl shimmer and holographic pigment that dries to a matte finish. I chose to add a top coat to this slate gray polish. It's subtle and classy. When left matte the holographic pigment will look like strong silver shimmer. This is two coats with a top coat. The first coat dries a little patchy, but the second coat completely evened it out. Icho Namiki is a vibrant and fun neon yellow (crelly), glow in the dark, UV reactive with gold micro shimmer. It also has a charcoal shift to blue flake shimmer. The shimmer may appear green because of the way it floats within the neon yellow. This polish is so much fun. It really glows bright in the dark. This is two coats with a top coat. 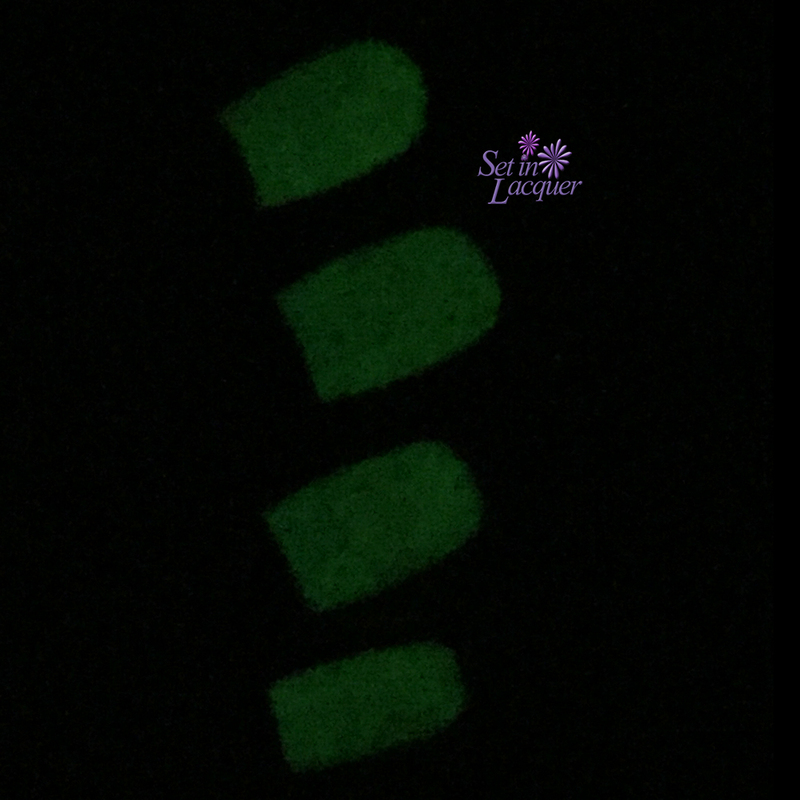 There is also a glow in the dark photo. My taking-glow-in-the-dark skills are lacking. But you will get the idea. Evening Walk in the Cherry Blossoms is a happy glitter top coat. The polish has a slightly tinted blue base (very sheer) and a blend of small sized holographic blue, purple glitters, iridescent glitters in multiple sizes and shifts. 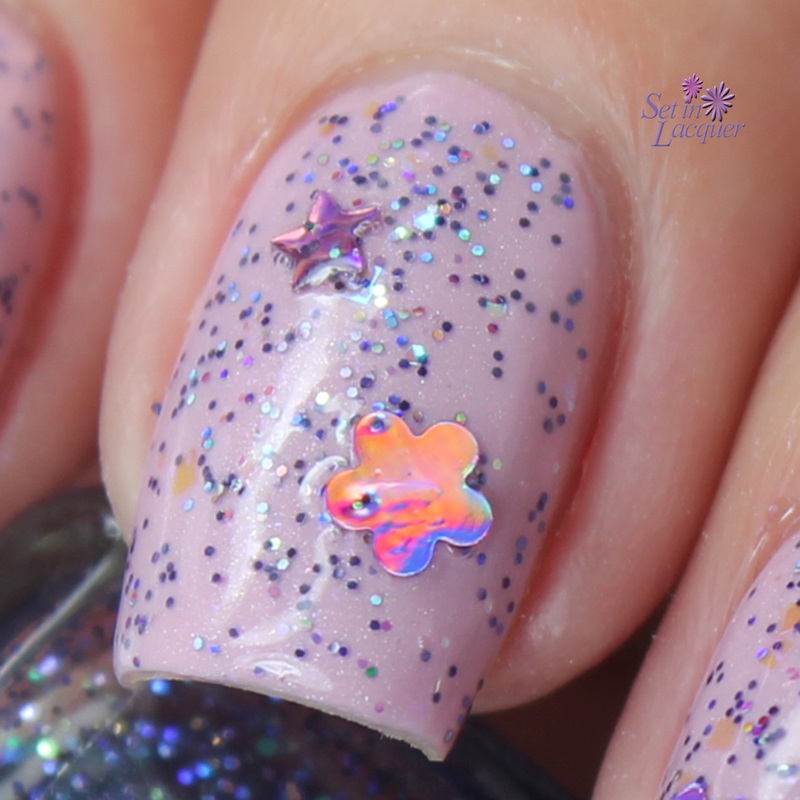 It also has sparse tiny fuchsia holo stars and sparse fucshia holographic daisy glitter. The stars and daisy glitter are sparse. They are simply meant to be a highlight. I have it on here over Hitsujiyama Park. 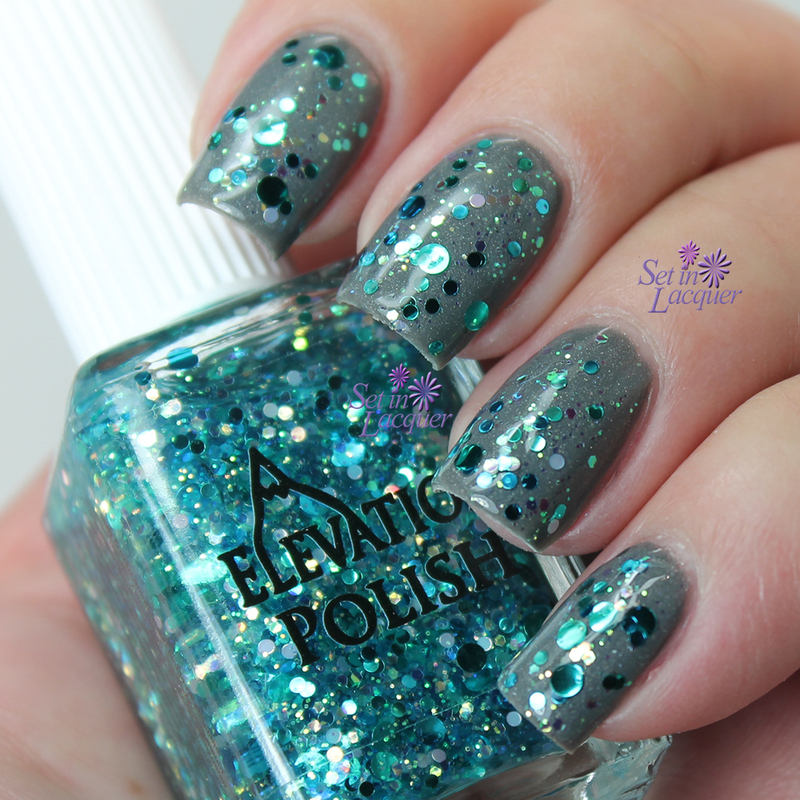 Stay Behind, Catch a Wave 2 is a glitter top coat in a slightly tinted blue base. It has five kinds of circle glitter (white, teal & blue), iridescent hexes and holographic micro-glitter in teal and green. This polish was originally launched in 2012 in the 180 Degrees South Collection. It was discontinued because the ingredients were no longer available. It applies easily and the glitters aren't shy. They rest flat against the nail. I have it on here over Hama Rikyu Gardens. This collection will be available May 7, 2015. 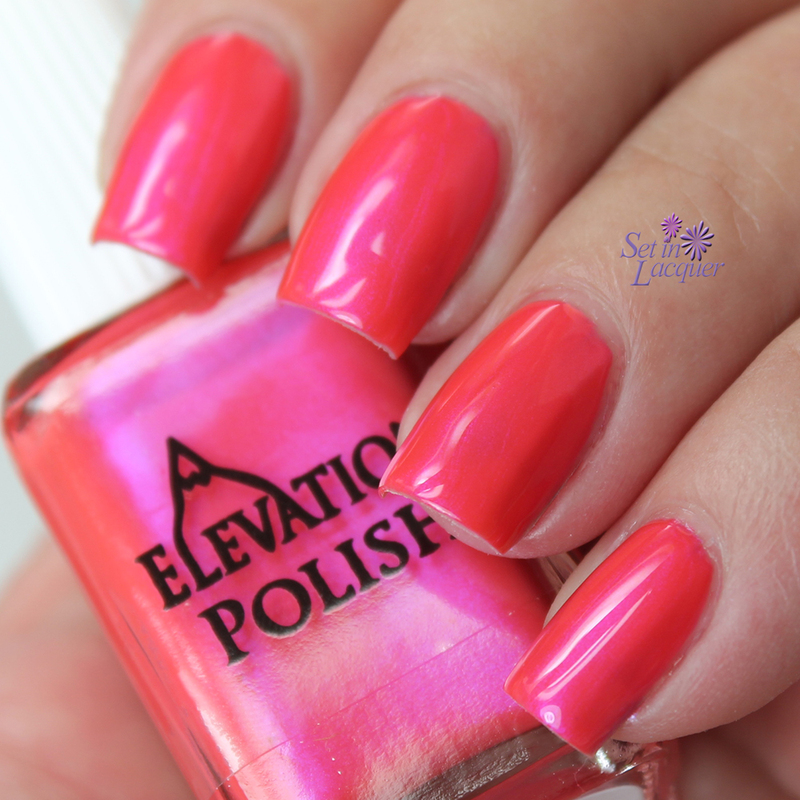 Elevation Polish releases new collections each month on the 7th and 22nd. So mark your calendars to visit ElevationPolish.com then. 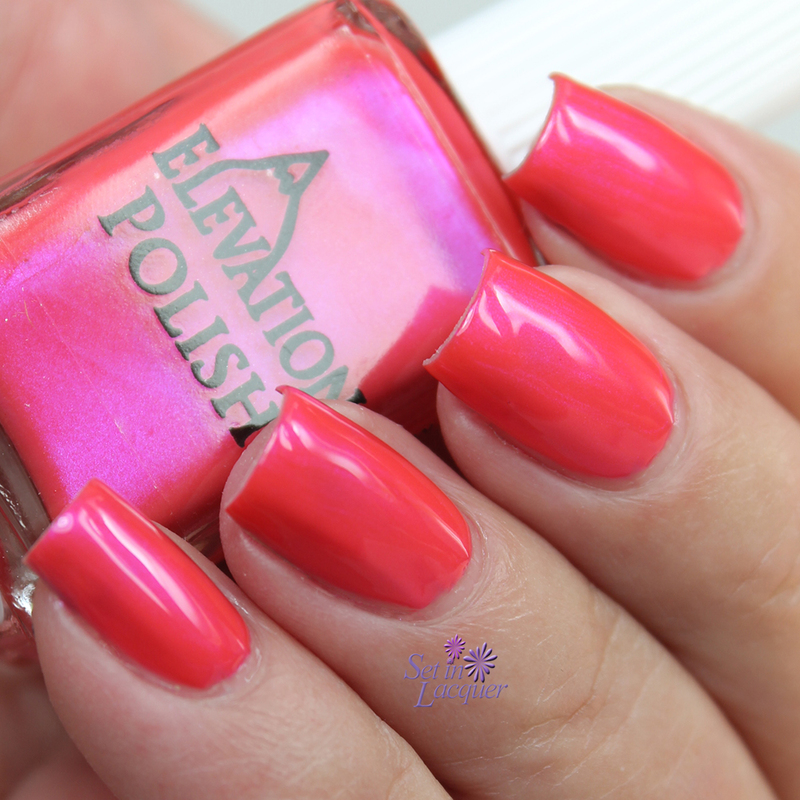 To get the newest information on Elevation Polishes, make sure to follow her on Instagram, Facebook, and her blog. OOohhhh these are all lovely! Really into the crelly yellow!